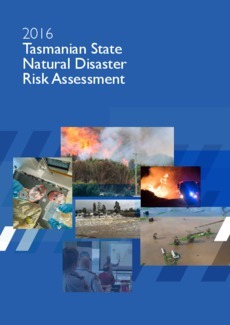 This report will help the Tasmanian community be better prepared for, respond to and recover from natural disasters through an updated understanding and awareness of the natural hazards that have the most potential to impact the State. The information contained in this report, including the risk register and risk treatment options together with the accompanying all hazard summary report, can be used by stakeholders and practitioners throughout the emergency management sector to inform emergency management planning. This report assesses the State level risks posed by Bushfire, Flood, Severe Storm, Landslide, Tsunami, Earthquake, Heatwave, Coastal Inundation and Pandemic Influenza. Bushfire remains the greatest aggregated risk to Tasmania. It is a ‘High’ or ‘Extreme’ risk across all sectors of society, often with catastrophic consequences expected every 30 years (i.e. ‘Unlikely’ likelihood). This likelihood is expected to become more frequent with climate change. Land-use planning and building systems are strong and effective controls for each of the hazards apart from Pandemic Influenza. Limiting future development and vulnerability in known ‘at risk’ areas is considered to be the most effectve way of protecting life and property while limiting future government liability. A ‘multi-hazards’ approach to exercises and business continuity planning within government was agreed to be an important treatment option, with hazard-specific training recommended for key incident management personnel (e.g. incident controllers) as well as formalising the arrangements to guide decision-makers in times of crisis to ensure rapid decision.